Vitória Flower Bouquet is a gorgeous combination of flowers in the colors pink, purple, white and lush greens which was specially designed for you to send your friends, family, spouses or girlfriend as a birthday, romantic or thinking of you gift. Stunning bouquet filled with love and appreciation to give as a gift to someone in Brazil. 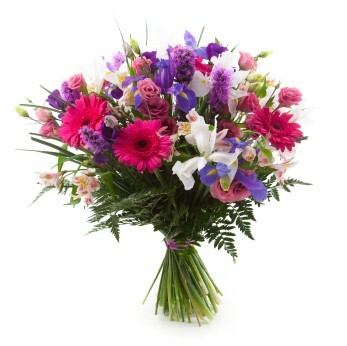 This combination of flowers in the colors pink, purple, white and lush greens will bring joy to your special recipient. The picture is illustrative but on the same quality standard as the bouquet delivered. Packaging and greenery may differ according to availability of our local florist however we guarantee the effect and satisfaction of recipient.